The oldest portions of the Arabian plate formed in the middle to late Proterozoic (800-650 Ma) when a series of island arcs and micro-continental fragments accreted against the northeastern margin of the Pan African Craton to form the Gondwana super-continent. The primary crust of the Arabian shield is composed of a combination of several constructional units, each of which was formed by an intra-oceanic island arc terrain consisting of an andesitic assemblage of meta-volcanic rocks and a dioritic suite of plutonic rocks. Each closure and arc collision led to deformation and ophiolite obduction (north-south units) and was culminated with microplate and continental collision at about 640 Ma. The last Precambrian orogenic event was concluded with the development of Hormuz saltbasin in eastern Arabia and is characterized by horsts and tilted fault blocks trending NNE-SSW (Beydoun, 1991). 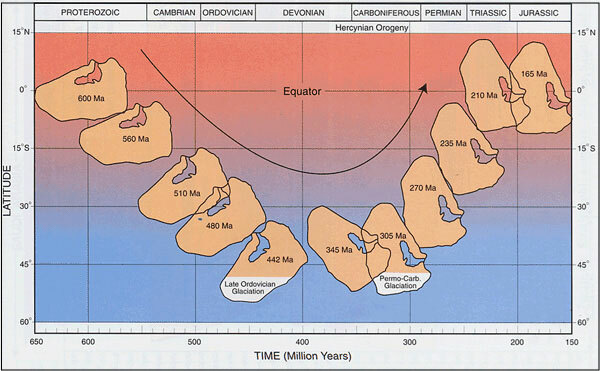 The Late Ordovician was characterized by the expanding of the polar glaciers across Gondwana and most of western parts of Arabia (Husseini, 1991). In the Early Silurian, sea level rose in response to deglaciation and resulted in the widespread deposition of the upward-coarsening Qalibah Formation, which consists of a lower Qusaiba member and an upper Sharawara member (Mahmoud et al., 1992). The Qusaiba member at the base of Qalibah Formation is an organic-rich shale corresponding to a maximum flooding surface. This "hot shale" unit ranges in thickness from 20-70 m. On the basis of carbon isotope and biomarker data, the basal Qusaiba shale is believed to be the principal source for the low-sulfur, light oil discovered in Paleozoic reservoirs of central and eastern Saudi Arabia (McGillivray and Husseini, 1992). 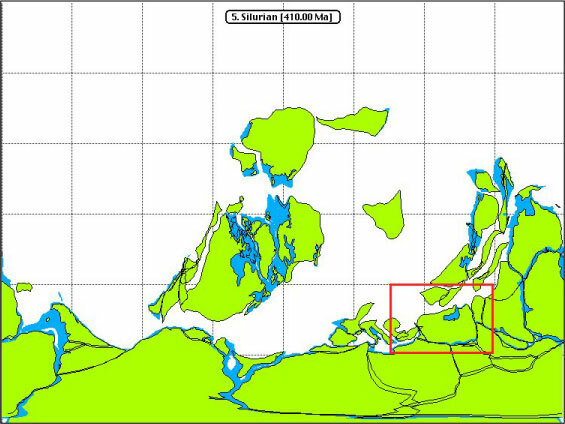 According to Vail (1977), a hiatus associated with a global sea-level drop occurred in the late stages of Silurian. During late Devonian, a Hercynian Orogeny structural event initiated the uplift of central Arabian and tilted the Arabian plate eastward, exposing Devonian and older rocks to erosion and transforming the northeast Gondwana margin from a passive to an active margin (McGillivray and Husseini, 1992). The Arabian Plate was also rotated through 90o in an anticlockwise direction. This tectonic event resulted from the collision between Africa and the North American-North European continent. This event produced a significant hiatus (pre-Unayzah unconformity" (PUU) or the Hercynian unconformity which produced significant uplift and erosion at the Ghawar region (McGillivray and Husseini, 1992). During this time the Unayzah Formation (50-300 m thick) accumulated and consists of fine to coarse-grain fluvial/alluvial sands that filled the relict topography formed by the differential erosion of the Hercynian structures. The Unayzah Formation forms the principal pre-Khuff hydrocarbon reservoir in Southern Ghawar area (Paleozoic) and central Arabia (Hawtah field). The NS-trending compressive Hercynian orogeny resulted in the forming or rejuvenation of the Central Arabian Arch, which is overprinted by the basement, cored Ghawar anticline (Konert et al., 2001). The movement of these arches persisted into the Jurassic and later. In the Late Permian, the Arabian-Gondwana/Iranian-Laurasia super continent was fragmented when the crust was stretched, and by the Early Triassic eventually rifted along the Zagros line to form the Neo-Tethys Sea (eastern margin of the Arabian Plate) (Beydoun, 1991). 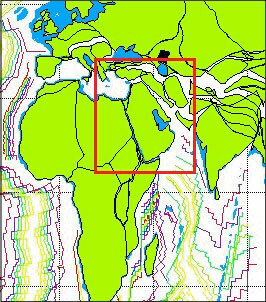 During the Jurassic the Arabian plate was relatively tectonically stable and was located at the Equator enabling the development of a wide shallow shelf on the western passive margin of the Neo-Tethys on which carbonates accumulated over the shelf and inner platform. 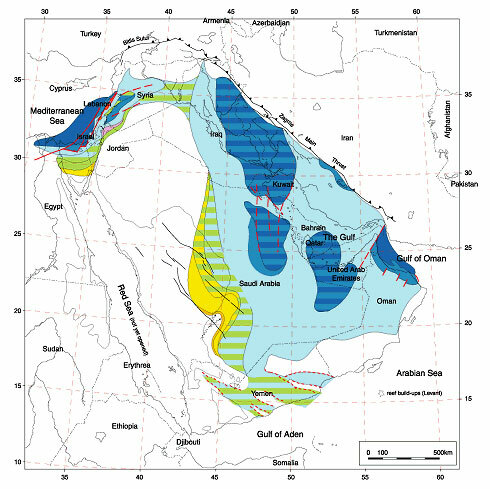 Most of the Arabian Gulf petroleum source-reservoir-seals accumulated during the Jurassic and Cretaceous. The climate became more humid towards the end of Early Jurassic. As a result, evaporites deposition was rare. Intrashelf depressions such as the Gotnia, the South Rub' AlKhali, and the Arabian Basins were created as a result of tectonic differentiation and rising sea level. The major formation of the Arabian platform was initiated in the Late Callovian, and caused the deposition of the organic rich rocks that form the major source formation in the anoxic intrashelf basins of the Middle East (e.g., Gotnia Basin and Arabian Basin). The carbonate deposition on the shelf kept pace with changes in sea level until the end of Jurassic when the major evaporitic seals were deposited during a fall in sea level as the climate became predominantly arid. The onset of the Alpine-Himalayan orogeny started in the late Cretaceous. The Neo-Tethys began to close and as a result of compression and foredeep developed in eastern Arabia. The re-organization of the Indian Ocean spreading centers (as a result of fast northward motion of Indian plate) thrust fragments of ocean crust upon the eastern Arabian plate continental margins (Semail ophiolite of Oman) (Hulver, 2000). This tectonic motion produced a major hiatus of sedimentation across the Arabian plate and the Pre-Aruma unconformity (PAU). Additionally, the "Hercynian" structures were rejuvenated and started forming the major eastern Arabian petroleum traps (e.g. the Ghawar anticline) (Beydoun, 1991). Compression between Arabia and Asia resulted in the initiation of the Zagros Orogeny. 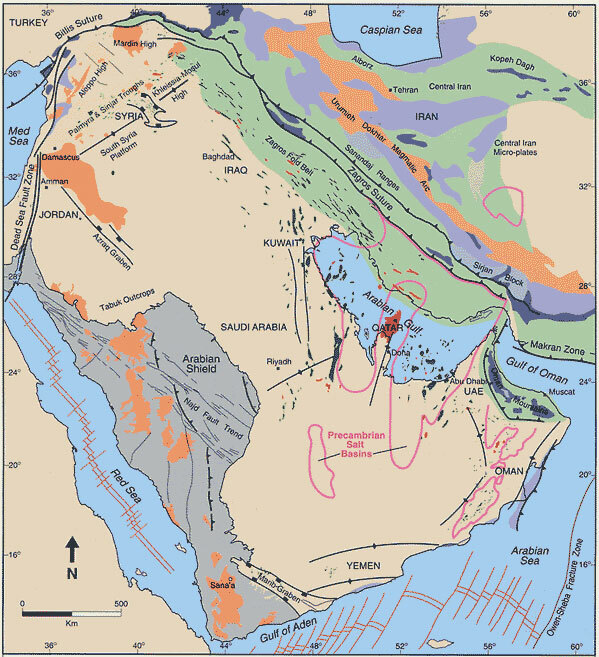 The Arabian plate converged and subducted beneath Iran and caused the Arabian plate to tilt slightly to the northwest to form a series of anticlines and thrusts in the Zagros Mountains. The Arabian Gulf foreland basin, which lies beneath the western edge of the Zagros thrust, was created as a result of this collision. The major Hercynian structures continued to grow leading to the completing the formation of the major oil traps (Hulver, 2000). 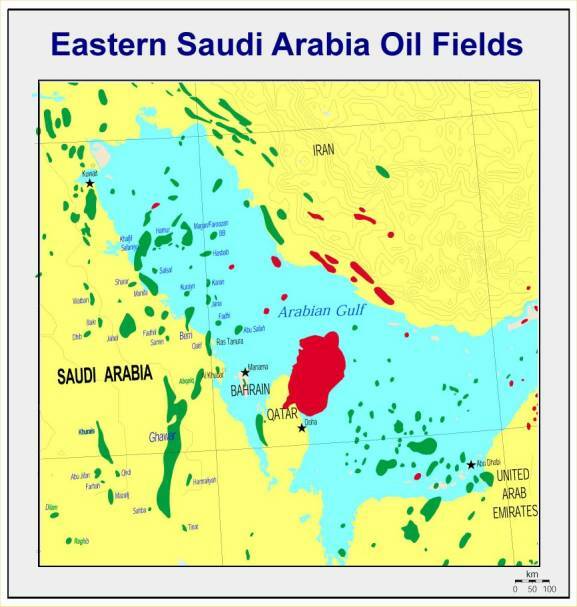 The prolific oil and gas fields of Saudi Arabia (northeastern margin of the Arabian Plate) are linked mostly to the margin's long and stable tectonic history (Beydoun, 1991). The virtually flat platform of the Arabian Plate was coupled with the almost uninterrupted accumulation of sheets of thick and uniform. Various local tectonic events lead to the formation of gentle structural traps and captured the generated hydrocarbons. 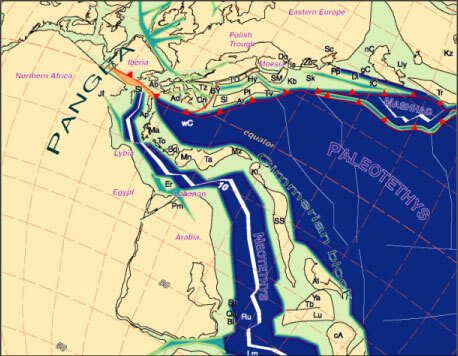 In summary, Arabian platform is comprised of Paleozoic intraCratonic basins overlying crystalline basement. The Mesozoic basins formed as the results of the Late Permian and Early Triassic opening of the adjacent Neo-Tethys Ocean and the development of its margins (Tethys passive margins). According to Murris (1980), in an area of over 2,000 km wide and 4,000 km long and over 3,000 m thick carbonates were deposited on the newly creating shelf margins. Later tectonic events lead to the deformation and compartmentalization and eventual formation of traps containing the prolific hydrocarbon reservoirs.